Everybody needs to see Stonehenge. But Avebury is the connoisseur’s circle: subtle and welcoming. 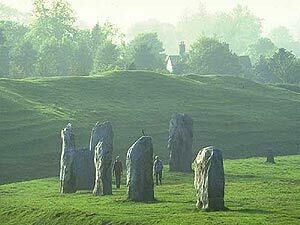 The stone circle at Avebury is bigger (16 times the size), less touristy, and, for many, more interesting than Stonehenge. You’re free to wander among 100 stones, ditches, mounds, and curious patterns from the past, as well as the village of Avebury, which grew up in the middle of this fascinating, 1,400-foot-wide neolithic circle. In the 14th century, in a kind of frenzy of religious paranoia, Avebury villagers buried many of these mysterious pagan stones. Their 18th-century descendants hosted social events in which they broke up the remaining pagan stones (topple, heat up, douse with cold water, and scavenge broken stones as building blocks). In modern times, the buried stones were dug up and re-erected. Concrete markers show where the missing broken-up stones once stood. To make the roughly half-mile walk around the circle, you’ll hike along an impressive earthwork henge — a 30-foot-high outer bank surrounding a ditch 30 feet deep, making a 60-foot-high rampart. This earthen rampart once had stones standing around the perimeter, placed about every 30 feet, and four grand causeway entries. Originally, two smaller circles made of about 200 stones stood within the henge (free, always open). Visit the Alexander Keiller Archaeology Museum, with an interactive exhibit in a 17th-century barn. Notice the pyramid-shapedSilbury Hill, a 130-foot-high, yet-to-be-explained mound of chalk just outside of Avebury. Over 4,000 years old, this mound is the largest man-made object in prehistoric Europe (with the surface area of London’s Trafalgar Square and the height of Nelson’s Column). It’s a reminder that you’ve just scratched the surface of England’s mysterious, ancient, and religious landscape. Eating in Avebury: The pleasant Circle Restaurant serves healthy, hearty à la carte meals, including at least one vegetarian soup, and cream teas on most days. The Red Lion Pub (The only thatched haunted Pub in the middle of a Stone Circle in the World) has inexpensive, greasy pub grub; a creaky, well-worn, dart-throwing ambience; and a medieval well in its dining room. Sleeping in Avebury: This makes lots of sense since the stones are lonely and wide open all night. Mrs. Dixon’s B&B, directly across from Silbury Hill on the main road just beyond the tourist parking lot, rents three cramped and homey rooms for a fine price. HisTOURies UK – They have the best local guides and best reputation and seem to be the most competitive. Drivers can do a loop from Bath to Avebury (25 miles) to Glastonbury (56 miles) to Wells (6 miles) and back to Bath (20 miles). 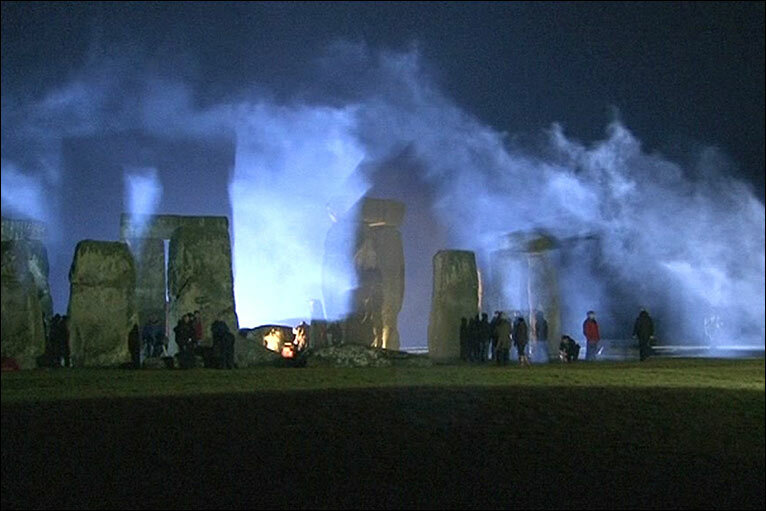 On Tuesday night, February 2, Wiltshire’s ancient stone monument was taken over by a film crew…..filming season five of BBC 1’s Doctor Who. Turns out that when the moon lies above the stone circle and the sun is on the opposite side of the earth, the stone circle acts as a gateway to a parallel time and place. Standing in the centre of the circle can allow one to be at one with the entire universe but unfortunately induces runaway ageing and exposure to other more evil personalities bent upon conquest. Dr Who finds himself imprisoned within the stone circle of an advanced extra-galactic civilisation and is held as a hostage until dastardly demands are met. The clock is running and the Doctor is rapidly ageing towards infancy. A twist in the tale is the entity that is allowed into the modern Human world when the stone circle is activated. Sadly, the choices are harsh…..either allow the proposed McDonalds drive-through planned for the Avenue, the bowling alley, the souvenir shop and the vast visitor facilities or, the Doctor will be wearing nappies for the remainder of this series and the evil personality (a hybrid mutation of David Icke and Schliemann) will win executive control of English Heritage. …plus returning professor River Song (Alex Kingston) have all been spotted on set – along with a brazier or two – the rumour is that the latest episodes including The Eleventh Hour, The Beast Below and Victory of the Daleks will all be set ‘some time in the past’. Avebury and Stonehenge can be explored with the click of a mouse from today as the National Trust’s most famous sites have been added to Google’s Street View mapping. Over 20 historic locations across the UK – including castles, landscapes and country houses – have been scanned using a panoramic camera, bolted to the back of a tricycle, and added to Google’s online mapping service. Austen fans with a romantic sensibility can even take a virtual turn around Lyme Park in Cheshire – made famous by Colin Firth’s emergence from its lake as Mr Darcy in the BBC’s adaptation of Pride And Prejudice. Google’s Street View cyclists pedalled over 125 miles on the 18-stone trike, following marked routes around the National Trust sites to capture them from every angle. “It’s a fun way to preview what to see and do on a day out,” he said. Google will continue to collect images from other National Trust sites throughout 2010, including UNESCO World Heritage Site the Giant’s Causeway, in County Antrim.